I’m going to be on SPOKEN HEARD! With Susan Dobbe Chase! Hi every one, tune in Sunday to listen to me being interviewed live by Susan Dobbe Chase with SPOKENHEARD! SpokenHeard is a forum for SpokenWord artists and has interviewed a ton of my favorite poets, so I’m honored and very happy to be on the show, so TUNE IN!! Check it out here SPOKENHEARD! 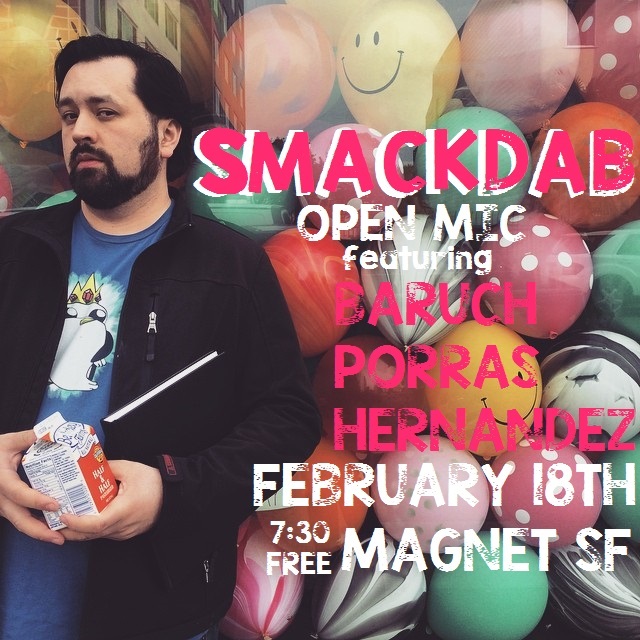 SMACK MY DAB TONIGHT, AT SMACKDAB OPEN MIC!! Hi guys, after 6 years I’m featuring at SmackDab again! Yay! Come check it out! It is a queer open mic in the heart of the Castro. If you’d like to perform at the open mic, please come beginning at 7:30pm and bring five minutes of whatever you want to share. Musicians: one song. Prose writers: that’s about two and a half double spaced pages of prose. We’re the friendliest open mic you’ll find but we pay attention to time. At Magnet, your neighborhood queer health center, 4122 18th Street between Castro and Collingwood in San Francisco. Accessible Venue. I’M PERFORMING AT OASIS SF, AT PERFOMERAMA!! I’m incredibly excited about this show. I’ve always been a big fan of Marga Gomez. Saw her show, Not Getting Any Younger, LOVED IT, and then I saw her other show Love Birds, LOVED it! And now I’m performing alongside at the new SF queer venue everybody is talking about! SF Oasis! 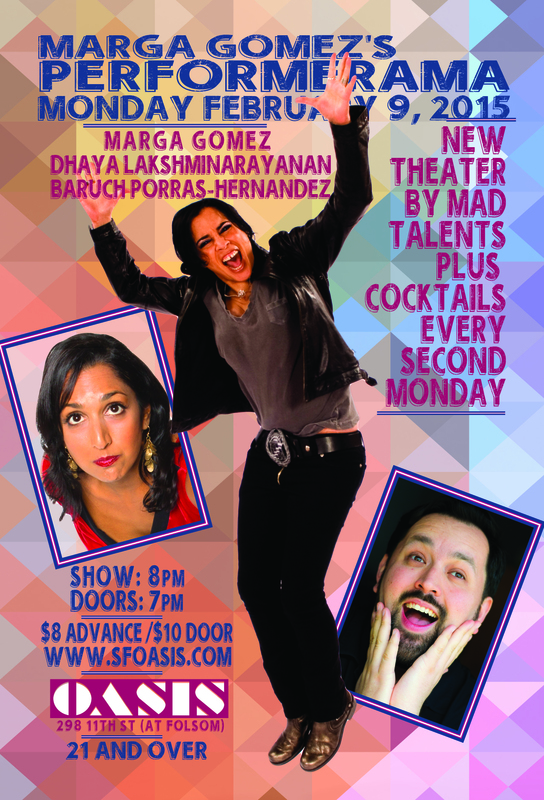 Joining us is the very very talented and very funny Dhaya Lakshminarayanan! So if you’re free Monday night, tomorrow actually, come see me at Marga Gomez’s PERFORMERAMA! Baruch Porras-Hernandez(that’s me!) will be doing an excerpt from his new show called “When I was a Color Kid”, that is the title of the excerpt, the show itself is currently titled “Agarrate.” but might change cause I’m terrible at making up my mind. Baruch Porras-Hernandez “When I Was A Color Kid” In 1985, one boy in Toluca, Mexico decides to wear princess sleeves, a head band, tights and gay it up to throw the gayest party of his life in a world where things that are fabulous get torn apart. Join Buddy Blue, Canary Yellow, Patti Green, all of Baruch’ cousins and of course Rainbow Brite for a story about having the courage to be who you are. Baruch, spoken word artist, actor, host, performer and storyteller holds a Lambda Literary Fellowship in poetry. He has performed all over North America and in the Bay Area at The National Queer Arts Festival and storytelling destinations The Moth, Bawdy Storytelling and The Shout. He is also a popular host and curator for KQED and The San Francisco Queer Open Mic. But you guys knew that already.